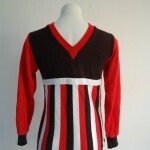 Whilst the AFL Competition is on a break , Amateur Team AFL Football Jumpers , are being worn . This morning spotted a green and gold VAFA guernsey , getting a workout at the local gym . Fans are wearing their amateur league football jumpers out , whilst the AFL colours are enjoying a well earned rest . Many of these jumpers are the traditional colours of AFL teams eg: red , white , and black , of STKFC. 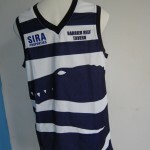 Stripes , V's , colours and sleeveless styles sometimes resemble their AFL counterparts . Some are old style woolen knitted jumpers , or acrylic fabric , and some have high numbers sewn on the back , and obscure club logos on the front . Often brilliantly coloured , these jumpers , can provide an entertaining piece of apparel , whilst the AFL Football Jumper , Jersey , Guernsey takes a summer holiday. This entry was posted on Wednesday, November 16th, 2011 at 8:47 am	and is filed under AFL, football jumpers. You can follow any responses to this entry through the RSS 2.0 feed. Both comments and pings are currently closed.